Lilacs & Lace: Tchaikovsky Times Two! Because I was volunteering at the Gala on Sunday, I was unable to hear the second half of the concert, so I went back for the final performance on Tuesday. Now, there was no way that I could compete with my Ceil Chapman gown, however, I was not going to show up in any old thing, either! The weather has turned wet and cold in Marin County, and in an effort to wear all of my cotton garments one more time before putting them away for the season, I pulled out this dress, which has been feeling neglected. 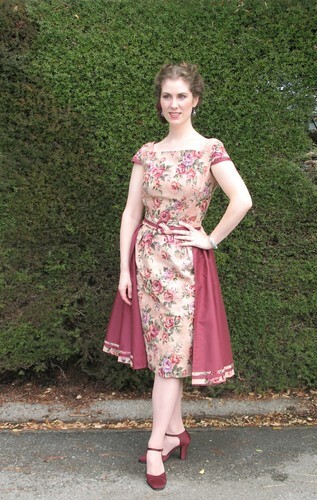 The pattern I used is Butterick 5032, a vintage reproduction dated 1952. 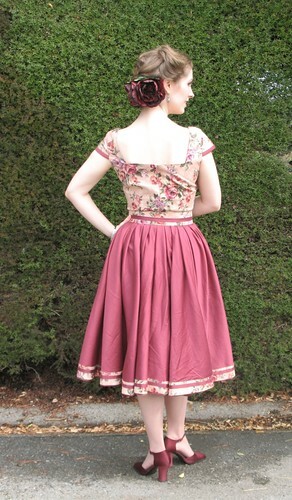 I previously used the capelet pattern as an accessory for this dress. My original thought was to accessorize the dress with the cummerbund from the pattern, however, when I lined the fabric (because the reverse side of the cotton did not look great), it made knotting the waist extremely bulky and awkward looking. Because I was not thrilled with the fit of the skirt back at the upper hip, I wanted something to cover it. 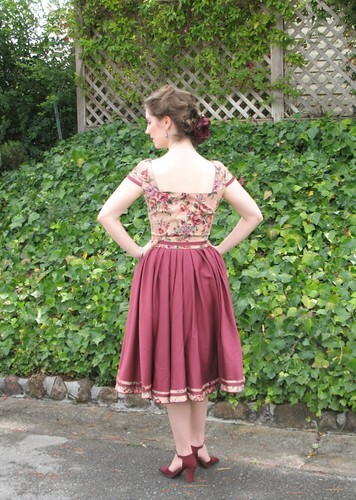 At that point, I had cut into the majority of my floral cotton, and did not have enough to make the overskirt. 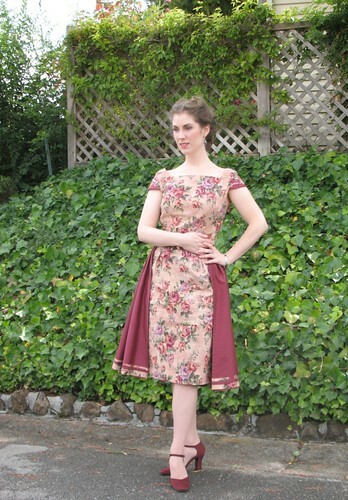 My solution was to use a wine colored cotton sateen as a contrasting fabric. Because the cotton was not sheer, I decided to leave the skirt front open so the straight skirt was not completely hidden. With my leftover floral cotton I made a belt and added a bit of bias trim the skirt hem. To keep the open skirt front pulled down, I tucked a fabric wrapped nickel into the hem on both sides which works perfectly as a dress weight. I also added little cap sleeves to make the dress more wearable, and edged them in the wine sateen to use the contrast fabric a bit more. The weather will probably not let me wear this garment until next year, but I hope to get a lot more wear out of it then. By the way, the symphony was absolutely fantastic! Floral Hairpiece: Made by me. 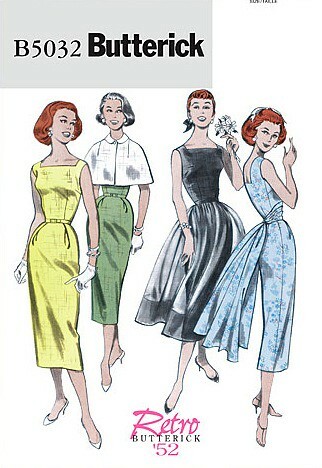 I've been following your work on the internet for months (Burda, sew retro, etc...). You are amazing... and I have a question : how is it possible to have the time to do all these things ? Do you work or are you at home ? No matter if you feel not to answer, congratulations from France ! 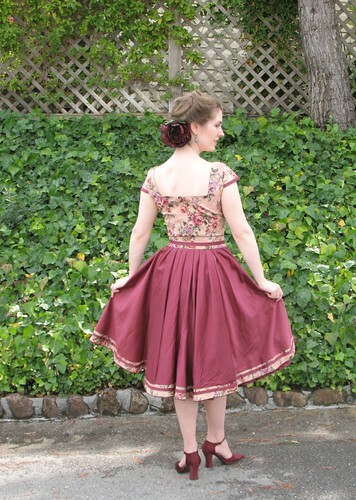 @Anonymous Anonymous: To be fair, I finished this dress a few years ago, so it is not like I whip out a new dress every couple of days! I work part-time, but sewing is what I would rather be doing, if I had the choice. It is one of my favorite ways to relax. Actually, I feel rather lazy if I am not creating something with my hands, so perhaps that is why my closet keeps filling up with self-made dresses!